For those who may have worked with those NTP Servers in the past you may know that (as the name suggests) they are a pool of servers and the IP address returned changes frequently. So, setting that value statically and forgetting about it led me to find a new Phone on a clients desk was not syncing the time. A quick nslookup showed me that the value I had entered into their DHCP Server was now not returned for that DNS name. It was easy enough to update this on a one time basis, but of course we know that at some point this new value will probably no longer be valid either. Luckily I already knew how to resolve names with PowerShell using the [system.net.dns] .net class. I’m calling it a class but I have no idea if that is the correct term. I knew which servers I wanted to query and entered those into an array. This would return a lot of information, and really we only need the IPv4 Addresses. We can use the ‘IPAddressToString’ value returned to just display the IPv4 Address. At the time of writing this returns 8 separate IP Addresses which is probably overkill for an entry into a DHCP Scope Option. So lets just take the first IP returned by the DNS query. This returns 1 IP for each $server we have listed. 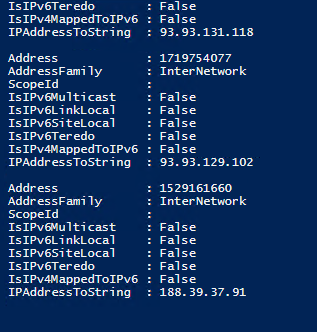 Now we need to do a little more work to get those values into a format the DHCP PowerShell cmdlets will accept. In actual fact the client where i was working on this only had Server 2008 R2 so I had to format it out into NETSH! We need to use Set-DHCPServerv4OptionValue to update our 042 value. So we can add an empty array to store our NTP Server Values, then add each IPv4 address to that array, then run the Set-DHCPServerv4OptionValue cmdlet using our $ntpServers array. Worth noting is that the –VendorClass property is CASE SENSITIVE. Which leaves us with the finished script. We can then save this as a PS1 file and use a scheduled task to run this script and update our Scope on a regular basis. If you’re interested in the NETSH command, it is quite similar except we push our $ntpserver array to NETSH instead of a PowerShell cmdlet. I need your assistance. How do I setup the new script (PasswordChangeNotification.ps1 in Task scheduler? I posted a video on my YouTube channel.